RoadMovie provides an easy way to index your video with chapters, this is done by adding a chapter track. A chapter track is a type of text track that provides an index to chapters or sections of your movie. The list of chapters, each of which links to a part of the movie, appears as a title or a pop-up menu in the movie controller. 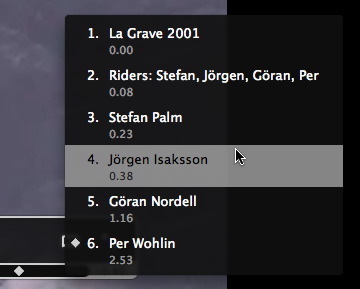 What kinds of QuickTime movies benefit from a chapter track? Adding a chapter track is easy. Just navigate to the Chapters pane using the main toolbar. You have three ways to add chapters. 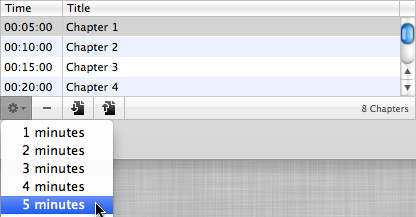 The first one is done with the Add every... button in the Chapters pane. Just hit the button and select a time interval from which you want the chapers added. Like this. In the Preview window you can add chapters manually. Just use the action button in the lower right corner to manually add a chapter at the current time. Continue to add more chapters if needed. The text file should have the following simple formatting to work with the import function. Select the chapters you want to delete in the table view and click the minus button. Click the Preview button to preview our video with chapters and use the chapters popup to jump to the chapter markers within the file. This is what chapters looks like in fullscreen mode in iTunes for example. Neat!